Made to Measure by Gucci was launched in 2013 after the incredible success of its sister perfume, Gucci Premiere. Designed as a partner fragrance by Creative Director and perfumer FridaGiannini, Gucci’s Made to Measure cologne is tailored after a man that is distinguished and motivated. The face of the perfume is none other than actor, director, and writer James Franco; a signature modern-day icon of sleekly cut masculinity. Known for his roles in Oz: The Great and Powerful, 127 Hours, and Spider-Man, Franco is always a man on display and just the fit for such a classy and polished fragrance. Made to Measure is pearlescent slate gray with a crisp, spicy aroma. The bottle, with its hand-brushed gold cap, is sophisticated and elegant. The black enamel inscription of Gucci’s famed founder, Guccio Gucci, symbolizes the attention to substance and determination that is the undercurrent for the fragrance. Top notes of Calabrian bergamot, Tunisian orange blossom, French lavender, and aniseed give it a clean, comfortable feel as though it were custom fit to the man. Underneath, at its very heart, notes of Sri Lankan Nutmeg, water lily, juniper berry, plum, and cinnamon seek to excite and enrich, while lavish base notes of cistus labdanum, patchouli, leather, and amber finish off a suite of smells that is truly made-to-measure. 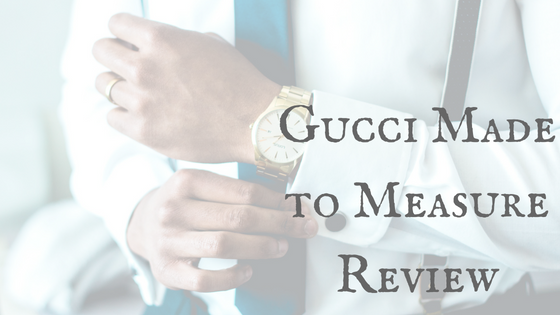 Gucci’s Made to Measure is designed for men that take great pride in themselves and their show—from the cut of a rich tailored suit to the crisp shine of a polished shoe to the sparkling glint of a bold-faced watch. Made to Measure’s smell is intimate and warm, like that first step out of a refreshing shower. Spices of nutmeg and cinnamon are strewn throughout, reinvigorating the senses. At the core of the Cologne, where notes of water lily and juniper berries lie, a ripe fruity aroma entices, iconic of the passion at the pit of a modern-day man. A signature Gucci fragrance, Made to Measure was designed for the contemporary man. This is not a perfume for the grandfathers or the youthful upstarts still waiting to dip their toes in the water. No—it is for men with clear purpose and direction, for men that have traveled and will travel, learned but not yet wizened. It is for men that have uncovered the truths and the mysteries and through their journeys have recreated themselves as perfectly as they’ve defined their style. Made to Measure is for men that know what they like, what they want, and do not hesitate to move. It is bold gracefulness. While many reviewers have praised Gucci Made to Measure for its even-balanced and classy fragrance, claiming it both strong and tender all at once, it has been criticized for being a hodge-podge concoction of several competing scents and notes that ultimately pull the cologne in opposing directions. The result, according to these critiques, is a watered-down and generic blend, albeit a bit sweet. Naysayers aside, Made to Measure is generally well-received. It is a long-lasting fragrance (around eight hours longevity) with ample projection. It is soft enough for both summertime and winter and strong enough to make a statement. Gucci Made to Measure cologne can be purchased through online merchants such as Overstock, Amazon, Fragrance Net, and The Perfume Spot. It can also be purchased and sampled in person at department stores such as Macy’s, Nordstrom, and Dillard’s and is sold in stores like Target, Walgreens, and Sephora. It comes in two sizes: a 3-ounce bottle, a 1.6-ounce bottle. It is a light eau de toilette spray that can be worn throughout the day or evening, in any weather.